The book's main character, the Russian writer and critic Art Troitsky, makes the claim that: "In the big bad west they've had whole huge institutions that spent millions of dollars trying to undermine the Soviet system. And I'm sure the impact of all those stupid cold war institutions has been much, much smaller than the impact of the Beatles." A grand assertion, maybe – but widely shared. "Beatlemania washed away the foundations of Soviet society," explains Mikhail Safonov at the Institute of Russian History. And the Russian rocker Sasha Lipnitsky – snowflakes falling on his beret as he talks to Woodhead in a park bandstand – insists: "The Beatles brought us the idea of democracy. For many of us, it was the first hole in the iron curtain." Indeed, the repression and harassment of the music ebbed and flowed as the party controls lapsed or intensified. "It went in waves: sometimes you could be approved for an official recording, and sometimes you were banned, losing your job or education. It must have driven them insane," says Woodhead. He not only excavates the minds of the rebels but also the propaganda machine at work. He recounts how a school staged a mock trial of the Beatles – broadcast on radio – with a prosecutor and denunciations in the manner of Stalin's show trials of the 1930s. A critical bulletin shown on state TV, entitled Pop Quartet the Beatles, told the story of how "these gifted guys could be real cash earners" while, "struck down with psychosis, the fans don't hear anything any more. Hysterics, screams, people fainting!" So ran the TV commentary, accompanied by shots of dancing fans intercut with images of the Ku Klux Klan and dire poverty in the American south. "Keep on dancing, lads, don't look around," the programme taunted, "You don't really want to know what's happening. Keep going, louder and faster! You don't care about anyone else." Looking through the other end of the telescope, it is enlightening to find what the Soviet authorities approved of. They "positively encouraged" disco music – the Bee Gees' Saturday Night Fever, Abba and Boney M (though Rasputin was officially banned) – because, says Woodhead, "it was musically rigid and could be contained within the dance floor, it wasn't going to spill out on to the streets". Why the Beatles? There is no hint of the Rolling Stones or the Who in all this. In Czechoslovakia, the underground was being inspired by dark dissonance in the Velvet Underground and Frank Zappa. "I think the Czechs had that recent memory of democracy, before the war," reflects Woodhead. "And their culture has roots in Kafka and the surreal. But Soviet taste was more melodic, they like tunes above all, even a little sentiment, verging on the beautiful – and there, I'm describing a McCartney song, not hypersexual rock'n'roll, or Street Fighting Man. 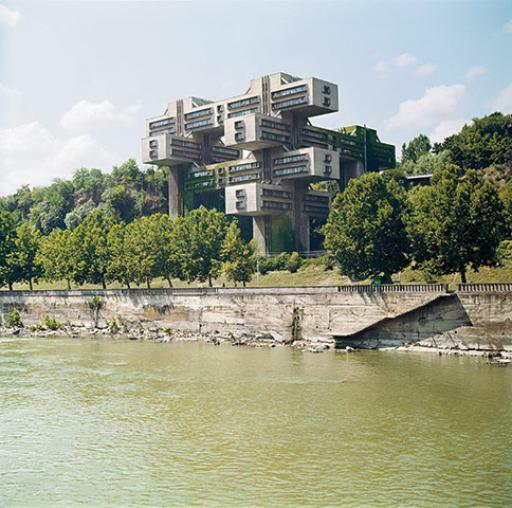 The buildings are catalogued in a new book by a French photographer, Frédéric Chaubin, who spent several years finding and recording them. The book may be the last chance to see many of them, which are likely to fall prey to the financial ambitions of oligarchs and property developers. There is a slideshow here. An Armenian-born programmer recounts how, during his childhood in the USSR, he stumbled across the KGB's technique for listening in on conversations in any home. Some time in 1981, I think, a relative from the U.S. comes to visit us for the first time since he left the country many years before that. He was going to stay in our house for a couple of weeks. My parents told me that such visits were always "monitored" by KGB, and so I should be careful with expressing any kind of anti-soviet ideas (which I was known for in the school). In the end though, nobody was going to take this seriously: neither the possibility of KGB agents freezing in cold outside watching us through the windows, nor any kind of bugs installed in our house. Something strange, however, had happened when our relative had finally arrived. Our phone went crazy. First of all, it was practically impossible to call or to take calls during that period. And besides, the phone's ringer started giving a single "ding" twice a day, exactly at 9 in the morning and 9 in the evening. The KGB, it seems, was using the ringers of telephones as crude microphones, responding to sound vibrations and feeding a very weak signal back into the phone line; when a house was noted as being of sufficient interest, a powerful amplifier could make the signal just about intelligible. The KGB only got caught out (to the extent of allowing a young boy to figure out what was happening, at least) due to the dilapidated condition of the Soviet phone system, and the tendency for lines to get crossed from time to time. Collarless Beatles jackets, known as "Bitlovka", were assembled from cast-offs; clumsy army boots were refashioned in Beatles style. And with much of the Western media blocked out, bizarre Beatles myths blossomed. Yuri Pelyushonok recalls hearing at school how "the English Queen gave John Lennon a Gold Car; but the Beatles had to play in cages to avoid their fans". The most persistent myth was that the Beatles had played a secret concert at a Soviet airbase on their way to Japan. Everywhere, fans claimed it happened close to them. Two fragments of the secret history of the Cold War have come to light. In 1969, US President Nixon sent a squadron of nuclear bombers towards the Soviet Union, and instructed Kissinger to tell the Soviets that Nixon was "out of control", leading them to believe that they're dealing with a dangerous madman, in order to scare them into leaning on the North Vietnamese government. Apparently neither Nixon or Kissinger had absorbed another Schelling insight - if you want to credibly pretend you are out of control then you have to push things so far that sometimes you will be out of control. The number of ways such a plan could have resulted in a nuclear war is truly frightening. After all, Nixon was gambling millions of lives on the Soviets being the rational players in this game. Fortunately, the Soviets didn't call his bluff and civilisation as we know it still stands. Meanwhile, it turns out that the West German policeman who shot dead an unarmed left-wing demonstrator in West Berlin in 1967, touching off riots and enraging the protest movement, had been working for the Stasi. The Fortean Times has an article looking at the story of Russia's lost cosmonauts. The story goes that, before Yuri Gagarin was successfully launched into space, the USSR sent several earlier cosmonauts up there, without success. The men (and one woman) perished, and the USSR, more concerned with collective prestige than individual human lives, obliterated all record of them from the historical record. Or almost all record; two boys in Italy managed to record their transmissions, in which they gasped for breath, complained of heat and cursed the designers of their spacecraft. The boys apparently managed to avoid being assassinated by the KGB solely by having gotten too much publicity. 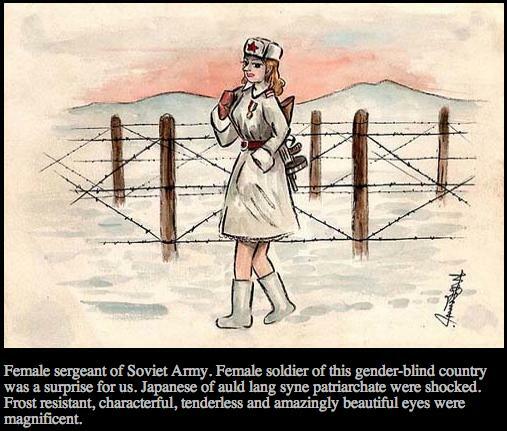 Read: Notes of a Japanese soldier in the USSR; the story of former Japanese prisoner of war Kiuchi Nobuo's journey through the Soviet labour camp system, told in watercolour drawings with captions. 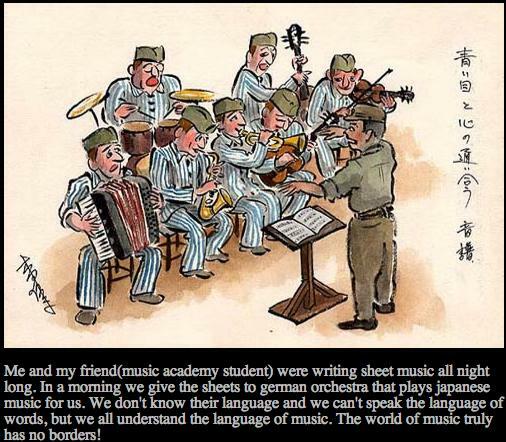 It's surprisingly lighthearted; while Nobuo mentions the death and hardship, he chooses instead to linger on the camaraderie between prisoners of different nations and the small moments of joy, beauty and levity. WIRED has a photo gallery of Soviet video games; these were arcade machines, sometimes inspired by American or Japanese ones, manufactured in the Soviet Union (often at military manufacturing facilities; presumably because civilian electronics manufacturers in the USSR weren't up to scratch). They often were more primitive than western counterparts (some feature mechanical score counters and lack controls that western equivalents had), cost 15 kopecks per game (not enough for most Soviet youth to be able to play more than a game a week), and thematically avoided the zapping-space-aliens themes of the capitalist world, instead combining a sort of earnest socialist benignness (there were Russian folk games adapted for the arcade, games simulating socially worthy occupations such as firefighting), with the odd bit of ideologically-sound militarism (sinking Nazi submarines during the Great Patriotic War, and shooting down enemy fighters (presumably of a capitalist persuasion, though the article didn't say)). Interestingly enough, a common feature of all the games was the lack of a high score table; the idea of such an individualistic, competitive feature was, for obvious reasons, frowned upon. Compared to western games, they looked a bit shabby and lacklustre. So as soon as Communism collapsed and Nintendos and PCs started flooding in, they pretty much disappeared. Most were destroyed, though a few survived; and now, four collectors in Moscow are finding and restoring these machines, for display in a Museum of Soviet Arcade Machines, which they have set up in a bomb shelter under a university dormitory. Museum of Soviet synthesizers; lots of info about various analogue synthesizers and drum machines (some conventional-looking and some weird) built in the old USSR; has photos, details and some sound samples. Krikalyov sneaked an amateur radio onboard Mir and used it to establish a link with the truck driver, who was heading to Kimberley. The unsuspecting driver thought it was one of his colleagues driving on a nearby road and called Krikalyov a prankster when the cosmonaut said was he was heading for America via India and China.